Hi, loves! Today’s post is brought to you by a heavily medicated Monica. I had an outpatient knee procedure, and I am still in so much pain. I should start to feel some relief Wednesday or Thursday, but for now I’m trying to stay off my feet. 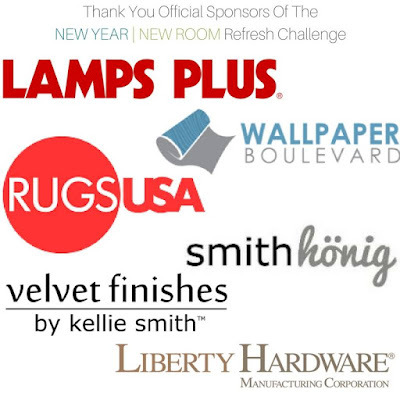 I do have a New Year New Room Challenge update though! 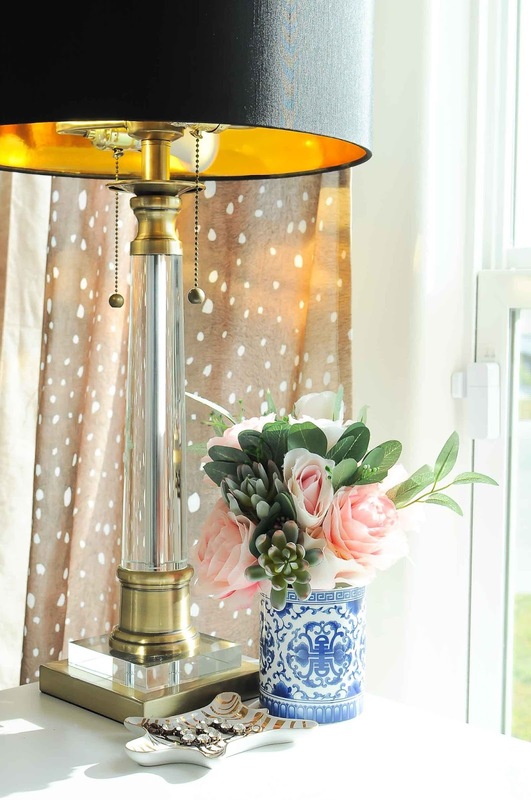 The challenge is hosted by Casa Watkins Living, and if you love global style, you’ll love her blog. 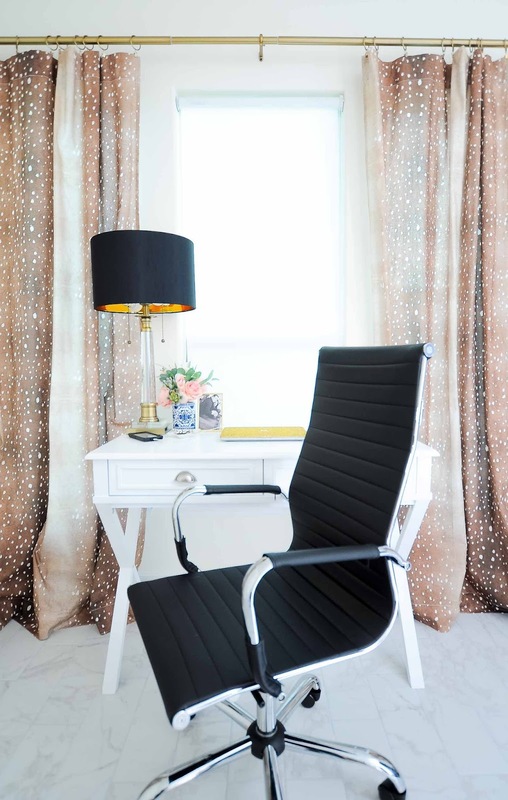 and week’s 3 post all about office lighting and office chairs. Sadly my rug didn’t come in last week thanks to a slew of weather delays (hey it happens- I’d rather the delivery men be safe and get home to their loves ones and stay off the roads), and I didn’t get my sconces hung, but what I did accomplish was getting my desk area set-up nicely. 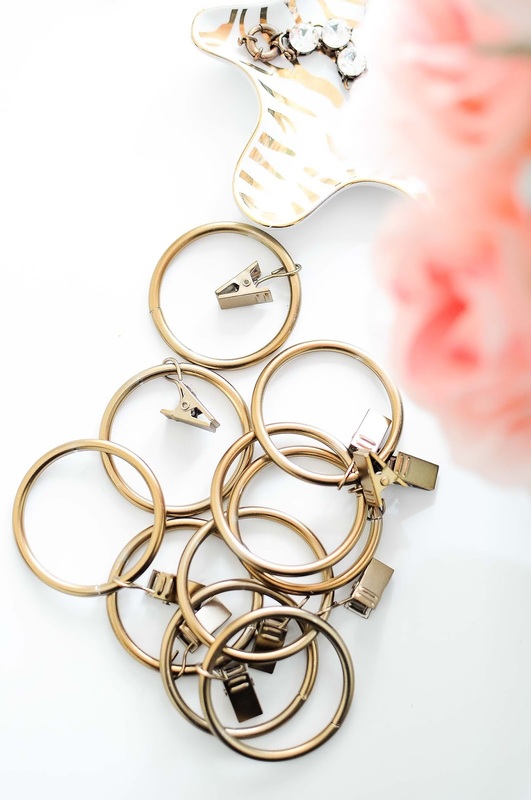 This meant getting enough of these gorgeous warm brass/gold curtain rings. Initially I bought one pack of 14 thinking 7 rings would be plenty for each panel, but it turns out 9 is the sweet spot per this post from Ballard Designs’ blog. I highly recommend the rings I have now bought 4 times, and the rings are perfect for beefier curtain rods like mine. 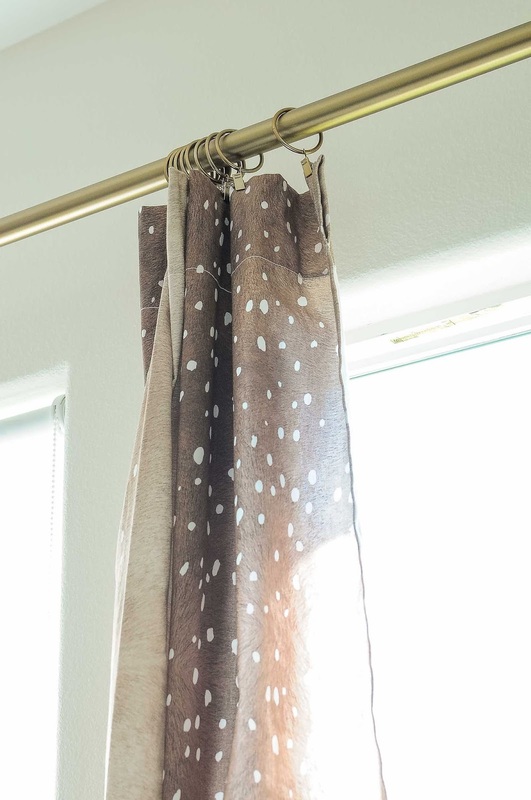 My fawn curtains (also could pass for an antelope type vibe) have been such a hit on my Instagram, and while people love them, a lot of people have asked me…how would I decorate with them? My answer is simple. Treat them like a neutral! 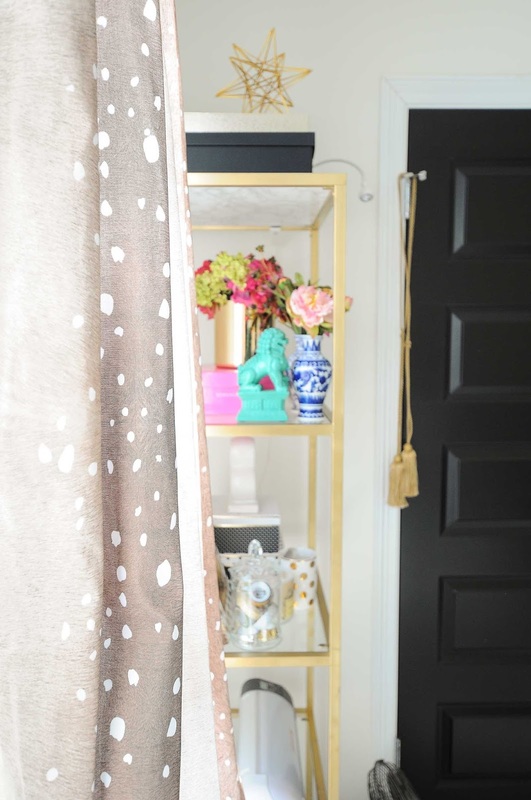 I’m pairing my fawn curtains with lots of brass finishes, florals, and some chinoiserie vibes. 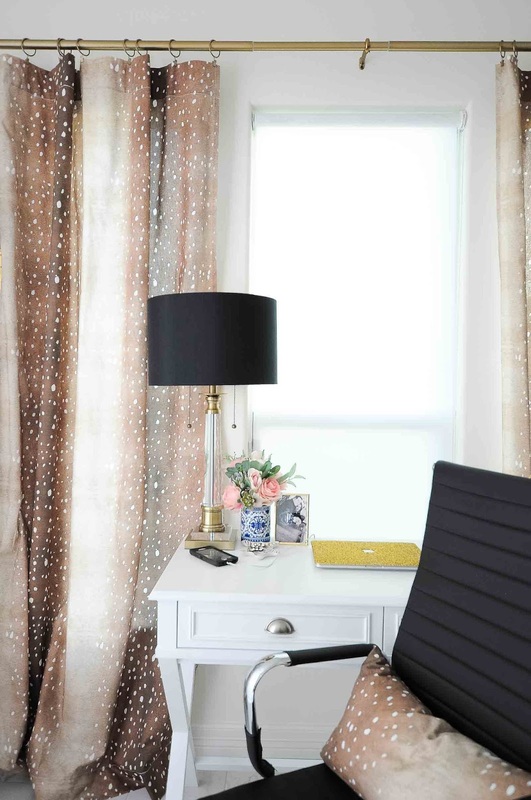 The curtains make an impact on the space, yet each of the details I’ve layered in also hold their ground. I have kept my walls bare on this side of the room so that nothing is truly competing with the curtains. Another consideration is that these panels are unlined, so at the brightest time of day some of the pattern on the curtains is “faded” and it leads to an ethereal vibe. I also would suggest keeping rugs to a more solid or natural type– I’m using a bleached sisal rug with a black border. Also working in other neutrals such as grays or even blacks will help add the style and contrast needed for a curated and polished look. Finally I got the white roller shade I ordered from Just Blinds- I highly recommend them because they’re so inexpensive, but I will say the first time I ordered from them I had my order in under a week and this last time took nearly 3 weeks. But for $29 for a custom size light filtering roller shade, I cannot and will not complain. I love that I now have privacy, but still retain all the beautiful natural light that beams into the office. Although I love the white walls in the space, I want an accent wall. 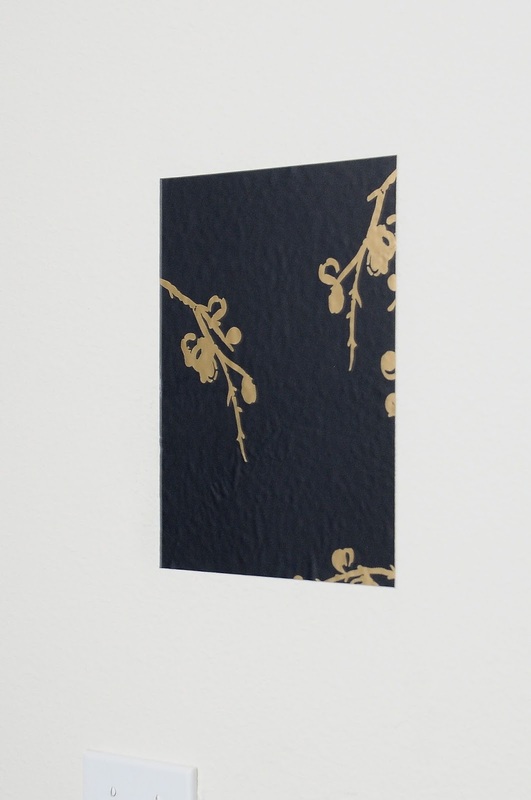 I received a sample of this gorgeous bird watching temporary wallpaper from Tempaper, and I am on the fence. The texture is clearly evident, but the texture would also be evident if I painted. 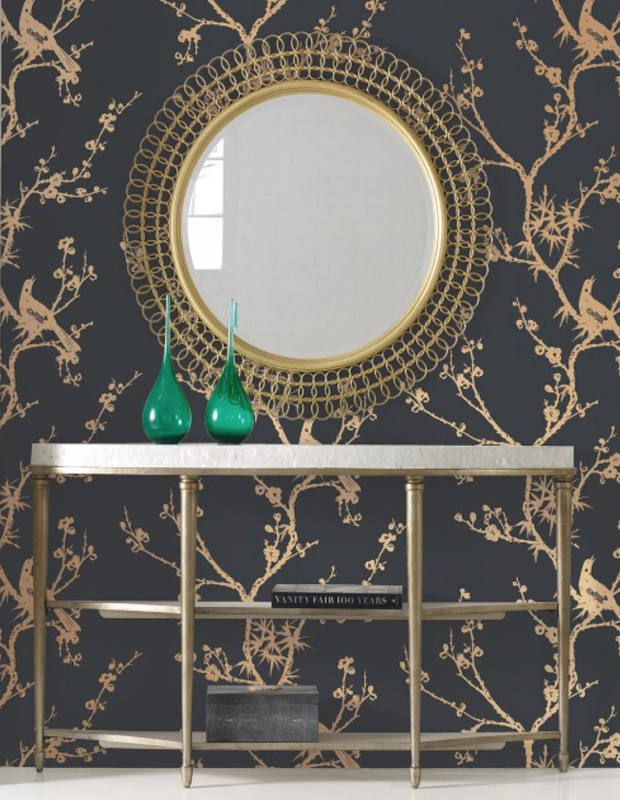 I think the gold birds would add to the chinoiserie vibe in an understated way, and the black wall may really set off the space. What do you think? Leave the wall as is or add the Tempaper? I asked this guy, and he was of no help. 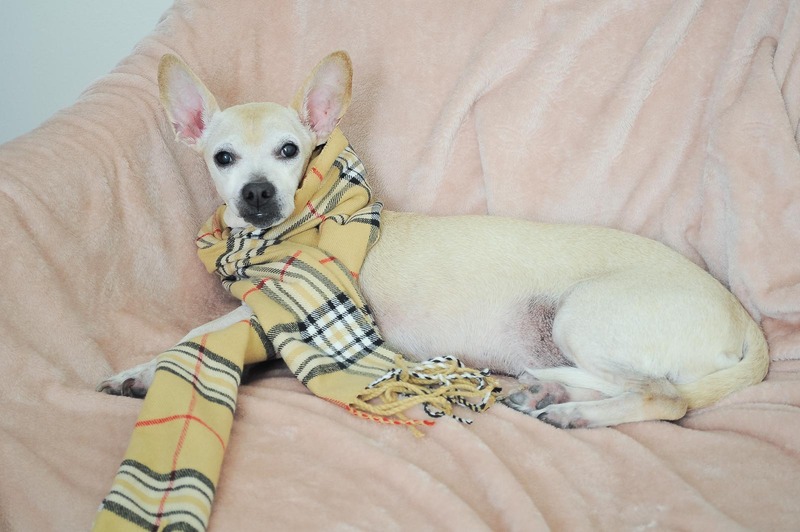 But he sure is cute in my faux designer scarf from the mall kiosk. I still have quite a bit to accomplish, but I think I can see the light at the end of the tunnel. Be back next week with some DIY updates and hopefully even more progress. If you’re refreshing a space, too, link up below! Recipes and unrelated posts will be deleted. Those curtains are so dreamy! 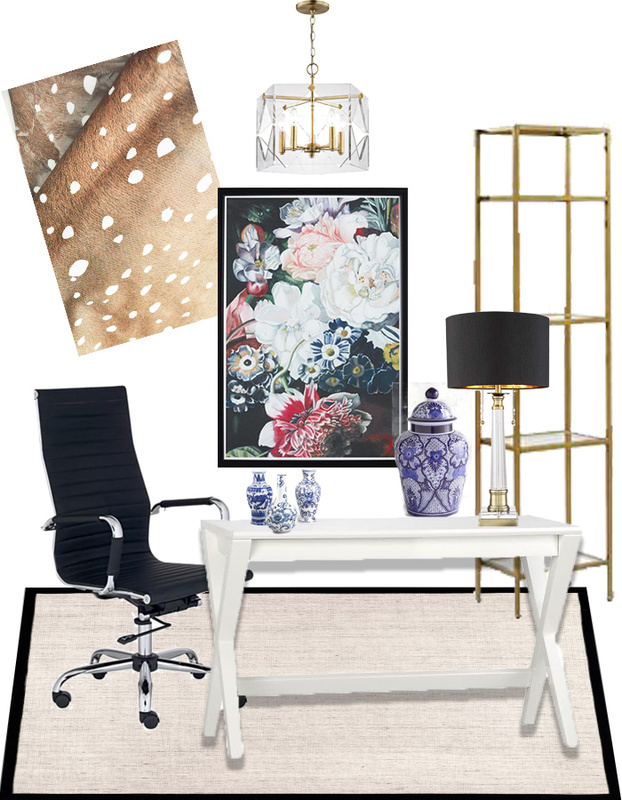 Love how you paired them with all the brass and chinoiserie. Plus your florals are always GORG! Poor baby! I hope you are feeling better! Fantastic tips for decorating with that beautiful print. Love the curtain rings too! I hope you are recovering quickly! Seeing that texture through the wallpaper would drive me crazy!!! I would smooth out that wall if I was going to use it. Perhaps you could apply a thin sheet of MDF to the wall? Modifying the wall or putting MDF isn't an option- it's a new home, so I don't want to ruin any walls with stuff like that at this point. Oh my goodness! Those curtains are fabulous! Super chic and I can’t wait to see how you tie all these patterns together! Stephanie- thank you! I'm hoping it all comes together. Your curtains are gorgeous!!! I prefer the Tempaper, it is so chic! It will work like a canvas behind your gold etageres! Your office is so beautiful even you have not finish with it! Monica, the Fawn curtains are so pretty. You have done a terrific job of decorating the space! I would go for the Tempaper as an accent wall to add a bit of glam; if you get tired of it, it will be an easy job to remove. Best wishes and prayers for a speedy recovery from your knee procedure!